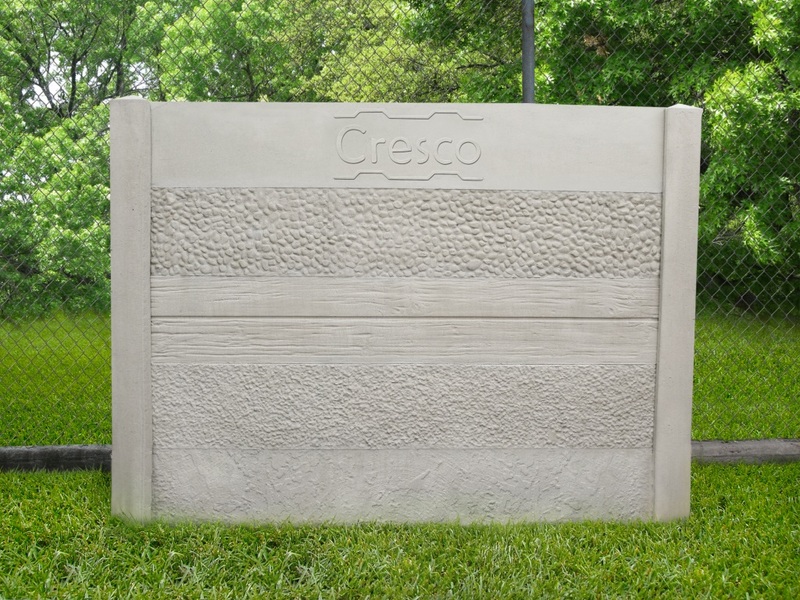 Houston, TX, October 27, 2015	(Newswire.com) - Cresco Concrete Products, LLC has brought mass customization to precast concrete fencing with the introduction of its low cost Econo panels as part of its proprietary Litecast™ concrete fence products. Company logos or family emblems can be incorporated into panels that make up a standard panel and post design. Your likeness, favorite image or shape can be embossed on concrete panels to create a one-of-a-kind look. Unique custom textures are also possible and all at a cost that is no greater than a typical precast fence. Litecast™ concrete fences feature posts and copings of steel and fiber reinforced high strength concrete and panels made from steel and fiber reinforced cellular lightweight concrete. Cellular concrete is produced by combining compressed air with a non-toxic liquid foaming agent, a foam is formed which is introduced into regular concrete leaving numerous discrete fine air pockets within the material. The air content makes the panels lighter in weight and also improves theirs noise absorption properties. Panel materials can also be customized to meet special requirements. Panels can be made from anti-ballistic materials for applications where projectile resistance is a must. Utility companies, for example, find this feature important in bullet proofing their walls to provide a measure of defense against terrorist and other threats. Ultra-low density, non-metallic reinforced super lightweight panels can also be produced as an alternative to wood or vinyl. These panels can be cut and shaped and be nailed or screwed to wooden or steel posts and would offer a greater range of texture options and more durability than wood or vinyl. For the environmentally conscious, panels with a high degree of recycled concrete are also possible. The included photo depicts the following five one foot tall panels stacked upon each other to form a display (from top to bottom): Custom logo design on Plain panel, Round Rock, Barnwood, Small Stone and Skip Trowel Stucco textures. The display is finished with Cresco’s Premocoat™ Microrender paint alternative which can be applied to concrete that is still curing. Cresco Concrete Products, LLC manufacturers its products from its facility in Houston, Texas and ships nationwide. The company’s products include the revolutionary Liteblok™ mortarless, interlocking building block, Litecast™ and Premocrete™ precast concrete fencing, pier and wall caps, parking stops, equipment pads, insulating skirting panels, fastening systems and stucco and paint alternatives. Cresco also offers cast stone products including accent blocks, address blocks, address markers, balustrades, bollards, columns, crown molding, entry ways, fireplaces, headers, keystones, mantels, pavers, planters, pool coping, signs, vent blocks, water tables, window surrounds and windowsills. Additional information about Cresco’s products can be obtained by contacting the company or visiting its website at CrescoConcrete.com. Manufacturer of innovative cellular lightweight concrete products including wall systems and precast fencing. Cresco Concrete Products, LLC introduces the Premocoat product line which includes a paint and stain alternative, stucco, surface bonding cement, an EIFS finish coating and an acrylic sealer. Cresco Concrete Products, LLC has expanded its selection of lightweight concrete pier and wall caps. There are now over 100 different styles and sizes available.